Drunken Angel marks Akira Kurosawa's first film with actor Toshiro Mifune, a collaboration that would endure for almost twenty years. It's also the first film for which Kurosawa claims full directorial authorship. The downbeat tale is unsparingly frank about post-war slum conditions, skirting the censorship restrictions of the MacArthur occupation. As in a Hollywood gangster film, a doctor and a criminal are offered as contrasting lead characters, -- except that false 'uplifting values' have been left out of the equation. Although both men eventually do the right thing, goodness cannot overcome the criminal code. The unique setting and great performances from Mifune and Takashi Shimura make Drunken Angel a Kurosawa must-see. Alcoholic Dr. Sanada (Takashi Shimura) runs a clinic in a Tokyo slum. He takes an interest in tuberculosis sufferer Matsunaga (Toshiro Mifune), a mid-range racketeer and boss of the local marketplace. Matsunaga treats Sanada with contempt but eventually puts some effort into a cure. That's when another yakuza chieftain Okada (Reisaburo Yamamoto) returns from prison, seeking to reclaim his turf, and the girlfriend he abused, Nurse Miyo (Cheiko Nakakita). Discovering that Okada and the big Boss (Masao Shimizu) now consider him expendable, the seriously ill Matsunaga decides to strike back. Kurosawa and Mifune's first and last films together form an odd pair of mirrored bookends. In Drunken Angel Mifune is the hardened criminal inspired by the concern of a flawed doctor. In 1965's Red Beard Mifune plays both roles in one, a wise doctor who must resort to violence as a part of his good works. Drunken Angel unflinchingly portrays the reality of the worst part of Tokyo in the early miseries of the American occupation. In a vacuum of civic disorganization, the slum centers on an open sludge pool, a festering dumping ground for trash and rotten food and a breeding ground for mosquitos. Crimelords have overrun the market town, and the ratty streets are dominated by bars and nightclubs with American-style entertainment. The gangsters wear American fedoras and three-piece suits. 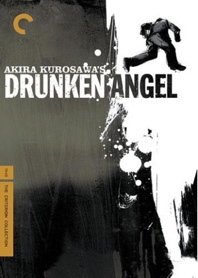 Dr. Sanada is the film's drunken angel. His schoolmates have gone on to prestigious jobs, and Sanada admits that his earlier dissolute lifestyle is responsible for his present poverty. Sanada's modest clinic is only a band-aid against an epidemic of tuberculosis and venereal diseases; his nurse Miyo was a former VD patient. Fancy good-time girls haunt the nightclubs while panpan prostitutes wait for traffic on the bridges. Enter Toshiro Mifune's Matsunaga, a lean and feral tough guy who asks Sanada to fix a scrape on his hand. The doctor pulls a bullet from the wound and advises the gangster that he's exhibiting symptoms of TB. Matsunaga's threatening attitude masks inner fears and disillusionment with his criminal lifestyle, and he's affected more by Sanada's lectures on the fraudulent Yakuza code than he lets on. The doctor claims that he doesn't care whether Matsunaga lives or dies, and that his only enemy is the TB infection itself. The ruthless Okada threatens all of the film's likable characters, but Matsunaga is moved to oppose him only when he finds that his professional code is a lie. Weakened by the TB, Matsunaga protests and loses his territory to Okada. In a strict Yakuza film -- a genre not yet completely formed -- Matsunaga's revenge would be a pure existential statement. Kurosawa makes the stumbling, coughing gangster a defender of righteous ideals. Drunken Angel is distinguished by Kurosawa's constant inventiveness. Returning from a long jail term in traditional robes, Okada sees the changes brought on by the occupation and is soon dressing like Hollywood's Rico Bandello or Tony Camonte. The first clue that Matsunaga has lost his turf comes when his live-in girlfriend politely packs up and leaves. A bar girl secretly in love with Matsunaga offers to go with him to the country, where he can recover. Stuck for a way to allow the weakened Matsunaga to challenge Okada without being immediately overwhelmed, Kurosawa arranges for their fight to happen on a floor covered with slippery white paint. Although Kurosawa takes pains to avoid it, his main characters are basically sentimental. The general hopelessness is lightened by Dr. Sanada's successful cure of a cheerful schoolgirl (Yoshiko Kuga), which may be a concession to public taste, or an expression of Kurosawa's optimistic worldview. Just the same, the film's lasting impression remains the agonized face of Matsunaga. Criterion's disc of Drunken Angel has an improved B&W transfer that still shows its age with signs of wear and occasional minor contrast fluctuation. The textured image reveals the makeup that gives the already gaunt Toshiro Mifune a particularly unhealthy look; by the end his eye sockets are completely darkened. The audio is greatly improved over earlier video copies, with the jazzy 'Jungle Boogie' nightclub song a standout. Donald Richie provides a commentary that sets Drunken Angel within the context of Kurosawa's early career. Another chapter of the Japanese It's Wonderful to Create series is offered, with more background information and interviews. Kurosawa and the Censors is an interesting piece by Lars Martin-Sorensen on the multi-tiered censorship gauntlet that resisted Drunken Angel's negative images of post-war Japan. Martin-Sorensen explains that the occupation rules forbade unflattering depictions of American soldiers. No Yanks appear in the movie, but Kurosawa puts three panpan girls in the very first shot. The teenage prostitutes serviced American soldiers, a fact the Japanese audience would immediately recognize, even if the soldiers could not be shown. Historian Ian Buruma's insightful essay shares the insert booklet with relevant excerpts from Kurosawa's autobiography. Criterion's producer is Kim Hendrickson. This January 15, Criterion's sub-label Eclipse will present a deluxe postwar Kurosawa set, including No Regrets for Our Youth, One Wonderful Sunday, Scandal, The Idiot and Kurosawa's essential atomic angst film I Live in Fear (Record of a Living Being).